It was just pure simple coincidence that we were visiting Pune in the thick of the 10 day Ganapathi festival that’s celebrated with great gusto across the state of Maharashtra, as well as in other parts of India. In February this year, on a visit to Pune, I had gone on a heritage walk through the older parts of the city. I intended to do the walk again to carry out research for an article that I am working on, but as luck would have it, the walk was cancelled on the Sunday that I was there. As if by divine providence the organisers of the walk were hosting another walk on the same day, but this was no ordinary walk – it was one that took us to the 5 most revered Ganesh pandals (temporary shrines) in the city. I was possibly the last person to get on the list that had 55 others registered for the walk that day. What is Ganesh Chaturthi and how is it celebrated? Neighbourhoods, establishments and communities build a pandal and install an idol made of clay, papier-mâché or most commonly plaster of Paris, followed by worshipping the idol as a group. At home, families install smaller size idols, and friends and relatives visit each other’s homes partaking in each others festivities. Immersion of idols in water marks the end of the festival. Preparations for the festival begin months in advance, with people placing orders for their idols and sculptors customizing them according to individual requirements. On the day of Chaturthi idols are installed in the pandal or at home accompanied by much fanfare. Public celebrations are funded by organizations and local communities and each year a lot of attention is paid to both the design of the idol and the pandal. While in different parts of India, different sweets are made in honor of Ganesha, in Maharashtra, modaks or a sweet similar to a steamed dumpling, stuffed with coconut, jaggery and cardamom, is the most popular offering. Ideally, an offering of modaks should have 21 pieces of the sweet. The first public celebration of Ganapathi as we know it today was revived in 1892, by Bhausaheb Laxman Javale, Balasaheb Natu and Krishnajipant Khasgiwale. While each of them had their own celebrations, it is Bhau Rangari’s (as Bhausaheb Laxman Javale was fondly referred too) that continues till date. One of the highlights of our walk was visiting Bhau Rangari’s house and his Ganapathi pandal that has the papier-mâché idol from 1892. Lord Ganesha is shown vanquishing a rakshaas or demon. The following year, Lokmanya Tilak praised the public celebration of the festival in his newspaper Kesari, and went on to install an idol in his newspaper’s office. This gave the festival a huge impetus and Sarvajanik Ganesh Utsav or community celebration of the festival took off in a big way. At the same time, India was in the midst of her freedom struggle and the festival served as a platform to unite people. People from all walks of life came together to celebrate Ganesha, and the festivities included dance, music, poetry and performance of plays, igniting patriotism and instilling a hope for a free nation. It was Tilak who began the ritual of immersion of idols into water bodies, which is a practice that is followed till date. However, as the number of pandals increased, there was rivalry amongst them as to who will lead the immersion process. Eventually, Tilak stepped in and put an end to this rivalry by declaring that the 5 Manache Ganapathis of Pune will lead the immersion process after which other pandals can take their idols for immersion. Janwani an organization that conducts heritage walks in the city of Pune, took us to 4 of the 5 Manache Ganapathi pandals across the city. Kasba Ganapathi is the most revered of the 5 Manache Ganapathis in the city, as the idol and the temple named thereafter are believed to be the Gramdaivat or presiding deity of Pune. The Peshwas worshipped Ganapathi with great fervor and Ganesh Chaturthi celebrations in Shaniwar Wada (the home of the Peshwas in Pune) was a grand affair. Kasba Ganapathi holds a special place in the hearts of the residents of Pune, and even today the first wedding invitation is given as an offering to the temple before distribution to others begins. The form of Ganesha housed in the temple is known as the Jayati Gajanan or the God of Victory. This is the male deity of the city. To find more about Kasba Ganapathi click here. Situated close to the Kasba Ganapathi Mandir is the female deity of the city of Pune, housed in the Shree Tambadi Jogeshwari Mandir. The Tambadi Jogeshwari Ganapathi is the Manacha Dusara Ganapathi or the Ganapathi that goes for immersion after the Kasba Ganapathi. The idol housed in a silver palanquin, has a face that resembles that of an African elephant. The idol is sculpted by the 4th generation of the Gulunjkar family. 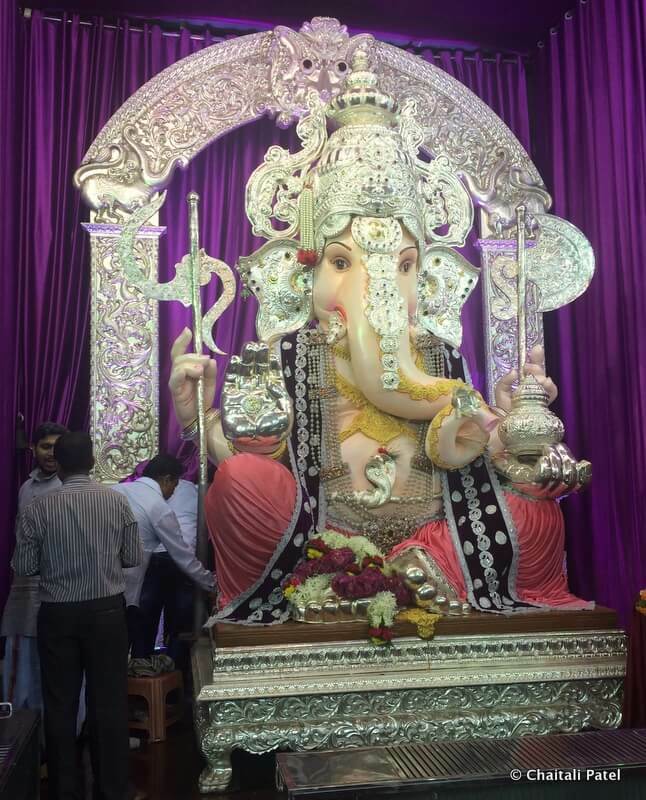 To find out more about the Tambadi Jogeshwari Ganapathi click here. 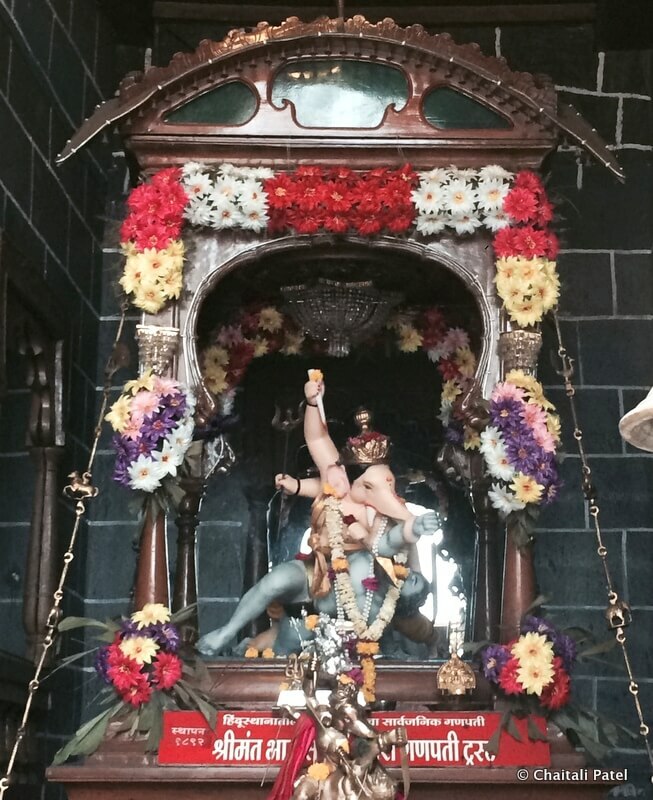 To find more about the Shree Tambadi Jogeshwari Mandir click here. This mandal gets its name from a wrestling pit in its vicinity. The instructor at the pit was fondly referred to as Guruji and hence the Ganapathi came to be known as Guruji Talim. Many mandals in the city like the Guruji Talim have connections with body building and fitness, and so the idols that are installed here are more muscular. It is said that the idol is shown wearing a langot or a loin cloth that is often worn by wrestlers. The idol is adorned by gold ornaments roughly 10 kilos in weight. 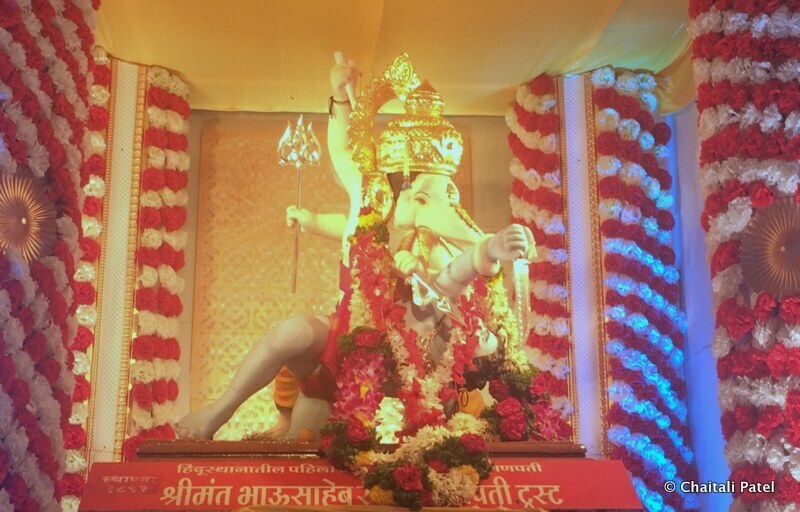 Located in a crowded street corner close to the Tulshibaug Ram Mandir, Tulshibaug Ganapathi is one of the biggest Ganapathi idols of the 4 idols that we saw. Around the idol, black and white photos of the different idols over the years since its inception in 1901 are on display. The idol made of fibre glass, is adorned with glittering jewelry that’s said to weigh more than 80 kilos. The 5th Ganapathi is that of the Kesariwada Ganapathi or the Ganapathi celebrations that were started by Tilak in 1894. Keeping Tilak’s spirit alive, the mandal organizes various activities that foster unity and provide a platform to individuals to showcase their ideas and creativity. The pandal has a beautiful hand painted panel that shows the life of Tilak as well as a brass statue of the dynamic leader. Apart from these Ganapathis there are several others throughout the city of Pune. Visiting these Ganapathi pandals requires a lot of walking and you have to brave massive crowds. There is no need to dress in Indian attire, however wear comfortable shoes that are easy to put on and take off. 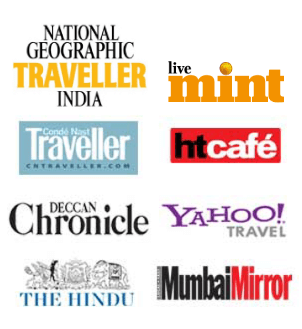 To find out more about the walks conducted by Janwani, click here. Thank you Rashmi! Glad you enjoyed it! Thanks Rutavi! It would have been nice to have met you… next time. Nice description and insights. Didn’t know many things. Glad that you could take this walk. 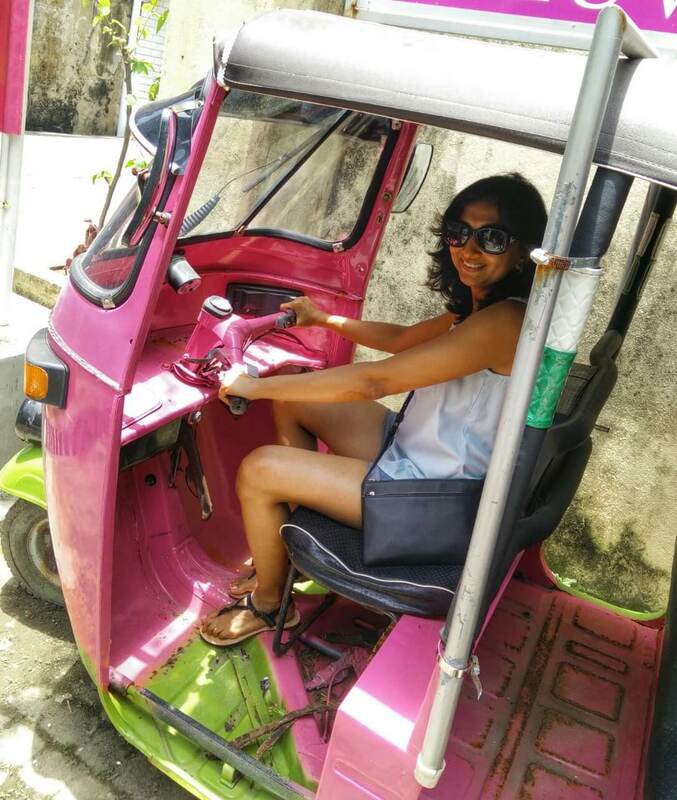 Same here Nisha – one of the highlights of the walk was finding out how it all started! Good to know the history behind this festival! I had read the connection with Tilak somewhere, unable to recollect completely! Tilak was responsible for popularizing the public celebration of the festival. He wrote about it in his paper as well! Great euphoria! I also wish to witness Durga Puja of Kolkata.